The Precast/Prestressed Concrete Institute (PCI) is the precast concrete industry’s leading trade association. Founded in 1954, PCI has dedicated over half a century to compiling an unparalleled set of resources and best practices regarding the design, fabrication, and construction of concrete structures and, through their Premier Partner Program, highlighting suppliers who offer products and services of great value to the precast concrete industry. PCI recognized Midwest as a Premier Partner in 2018, acknowledging the industry-leading effectiveness of Midwest’s dust control products and managed service programs for precast concrete erectors, manufacturers, and raw product suppliers across the country. Last month, Midwest participated in PCI’s Precast Show,in Louisville’s Kentucky International Convention Center. As the largest precast-specific event in North America, the Precast Show is the one place where you can find all of the industry’s most important suppliers and equipment experts under one roof, and Midwest was honored to participate. When it comes to precast concrete, dust isn’t just a nuisance — it brings an array of potential risks, from health and environmental consequences to the erosion of any worksite. While precast concrete is known to be a durable, cost-effective, and versatile construction material, there’s a risk that substances in concrete can negatively impact worker health. When workers drill or cut into objects that contain crystalline silica, the silica releases dust particles into the atmosphere that can be hazardous to both the nearby ecosystem and workers’ health. Meanwhile, the cost of OSHA citations continues to rise; repeated violations can now cost employers well over $130,000. That’s why effective dust control on roads and yards at these worksites has never been more crucial — and why Midwest has spent the past 40-plus years establishing itself as a market leader in industrial dust control product innovation. 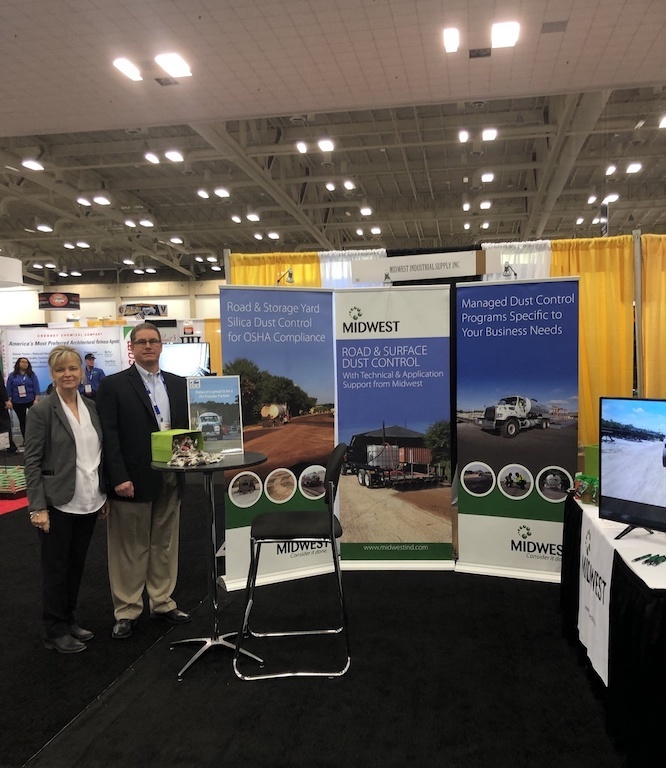 Midwest’s inclusion in the 2019 Precast Show presented an exciting opportunity to further spread the word about our innovative, effective, and environmentally-friendly dust control products among the industry’s best and brightest. If you missed Midwest at the PCI show in Louisville, be sure to catch us at the PCI Tour, May 14-16 in Sacramento.